Home › Promotions › Harley Bucks are Back! 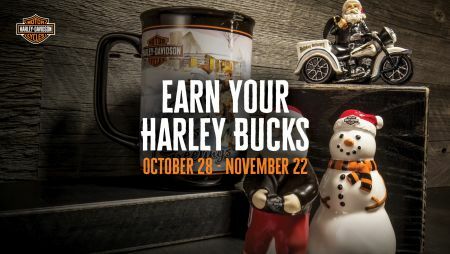 Stop by Redstone Harley-Davidson now through November 22nd, and earn Harley Bucks each time you make a purchase in Motorclothes or Parts departments. Those Harley Bucks can then be redeemed in-store Black Friday Weekend, November 24-26, 2017. Then, on Black Friday Weekend you can spend your Harley-Bucks like Cash!